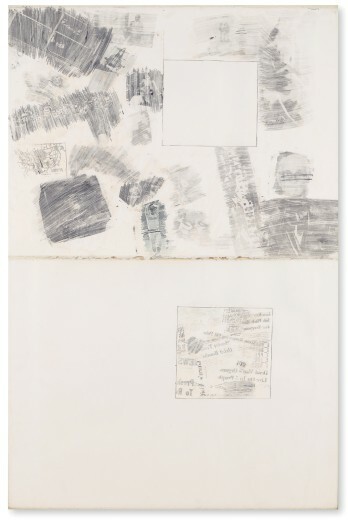 Submitted by the artist to the Whitney's 'American Drawing' show of 1973, this two-sheet work contains a compendium of Rauschenberg's political and artistic lexicon. The upper sheet includes images of Barry Goldwater (whose face is cancelled out by two strokes of Rauschenberg's crayon0 and Denny McClain, Detroit's first and only pitcher to win 30 games. The negative pace in the upper sheet reappears as a positive in the bottom sheet, literally crammed with overlapping headlines.